Kazan is the main city in the Republic of Tatarstan, it has an official status of Russia’s third capital. Here Slavic and Oriental culture, modern achievements of civilization and ancient monuments of history met and intertwined, forming a single picturesque place with authentic atmosphere. 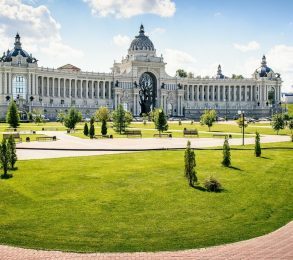 The city is actively developing in the scientific, sports and cultural areas, so it is easy to choose tours in Kazan for anyone’s taste. Spring in Kazan comes into its own in April. The megapolis gets rid of the snow shackles, the temperature steadily keeps above +5. First flowers bloom, the trees green with young leaf in the well-groomed parks and squares. 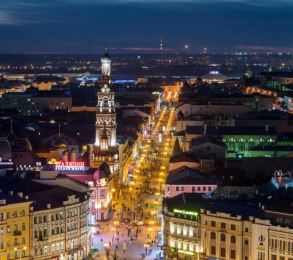 It is especially pleasant time for walking sightseeing tours in Kazan. The seasons of golf and horse racing start from May. Easter holidays are celebrated on the squares and on the island of Sviyazhsk in accordance with the Russian traditions. The average temperature in summer in Kazan is +18 to +20 degrees, there can be jumps up to +30 and evening cold snaps to +12. 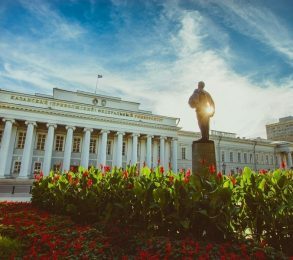 This is a favorable period for contemplating the city panorama from the cozy side of the boat on a trip along the Volga River to the peaceful island of Sviyazhsk. At this time of year, flowers planted in flower beds in the form of shrines bloom among the monasteries and temples. 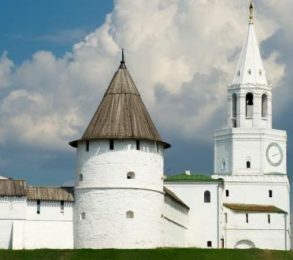 There are old wooden churches and a historical and archaeological museum on the island. Guests and residents can attend 12 well-kept beaches, 4 of which are available for swimming from June. In August, there are festivals dedicated to jazz, ethnic music and opera. In June, the capital celebrates the bright national holiday Sabantuy, filled with the spirit of ancient folk traditions. 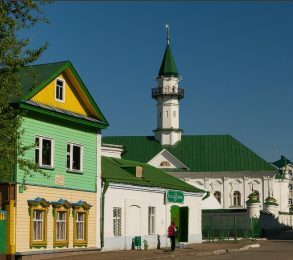 Autumn in Kazan opens the festival of Muslim cinema, which takes place in the first weeks of September. Usually, the above-zero daytime temperature stays steady until October. At this time of the year, open air excursions in Kazan delight the eye with architectural masterpieces framed by colorful foliage. Winter comes into its own in mid-November. Severe frosts rarely disturb the city; the temperature is kept at around -13 degrees. Sports activities are held all year round, in winter there are ski resorts and many skating rinks. 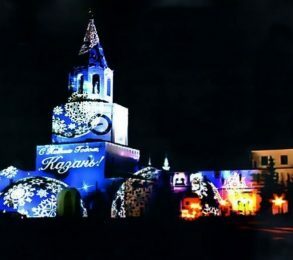 Winter last-minute tours in Kazan will present the capital in a new light, fancy illumination transforms the city, bringing the scents of magic and fairy tales. 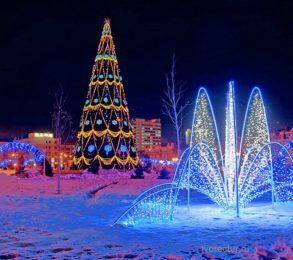 A skating rink near the “Arena” stadium, decorated with lights and a New Year’s tree, is open overnight. Bus tours, countless museums and places with authentic and foreign cuisine will shelter from nasty weather. 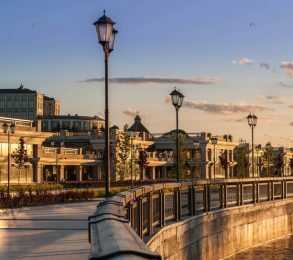 Kazan is rich in sights so you need to be ready to walk a lot. Take comfortable shoes, raincoat or umbrella to cover from rain, and in hot season – take a hat. You need to know that there are winds on the viewing points’ height even in summer. For street walking you need no special wear. But when going to church or mosque women need a special wear: skirt covering knees, blouse with long sleeves and a kerchief. It will help to enter without problems. 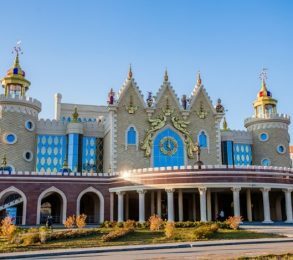 Buy a tour to Kazan is an optimal variant for romantic journey, family vacation with children and joyful trip with a noisy crew. There are entertainments for everyone.